Leaders place great emphasis on productivity, teamwork, focus and other catch-words to improve company efforts. In our race to get ahead, we may be losing track of one thing that unifies our thinking, our actions, and our interpersonal relationships. Wisdom is a concept well worth bringing to light as we strive to succeed in business. Stop and contemplate: How wise am I? As we do, we’ll find ways to improve not only our lives, but the lives of the people around us and the health of our company as well. Wisdom has been called the highest state of knowledge, our peak performance, and a vital source of human capital. It is the best reason to make and encourage good decisions. How do you know if you have wisdom? Experts offer different criteria for wisdom. However many agree on these attributes. How many of these do you have? Knowledge. Wisdom begins with an extensive data base of knowledge. This encyclopedia of experience produces rich procedural knowledge. It creates effective ways of thinking about problems and helps form possible solutions. Empathy and compassion. Wise people put themselves in another person’s position and see their point of view. They feel the emotions and beliefs of others. 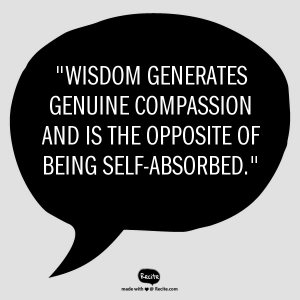 Wisdom generates genuine compassion and is the opposite of being self-absorbed. Recognize different points of view. Often the conflicts in business, relationships, or society consist not of good vs. evil, but two good in conflict with each other. Truth does not come neatly packaged in one set of values. Wise people are open to a range of thoughts and values, accept the tension they bring and work to find common ground with discordant views. Perspective. Wise people see the broad picture. They rise above their own perspective so they can view situations dispassionately. They see through the complexities to the essence of the issue. They bypass rhetoric to find and dissect the heart of the problem. Self-restraint. Wise people temper their emotions, particularly when faced with a setback. They don’t fly off the handle. Faced with suffering, calamities, or crisis they step back. They learn from it and see the problems as puzzles to solve. Aware of limits of knowledge. Wise people accept doubt and ambiguity as part of life. They are not enemies to be fought against. One must work through life recognizing there are times when one simply doesn’t know. Wisdom accepts the unknown and unknowable with equanimity. Evaluate your thoughts, actions, and decisions over the past week. How many of these qualities have you brought to the table? Wisdom requires all of them — and may benefit from additional traits like prudence, commonsense, and judgment and humility. Perhaps wisdom is thought to belong to the old because it takes time and experience to master these qualities. However, as you assess and then conquer — these attributes you will find your decisions have greater impact and produce better results. You’ll find your relationships with co-workers and management improve. You will bring priceless wisdom to the workplace.